Above you can see an updated version of the Facebook Fanpage for Essencia Salon Spa & Boutique with a very festive looking theme. Every holiday and/or season, Essencia updates their Facebook Fanpage to increase recognition of their brand through the seasons and to show their activity on Facebook. If you are a business owner, I would suggest making these visual changes at least quarterly to keep your page looking fresh and most importantly alive! 1. Profile Picture: Give the profile picture seasonal elements like snowflakes, leaves, or flowers. Try to use a color that you can use in all elements of the Facebook header. Bonus! 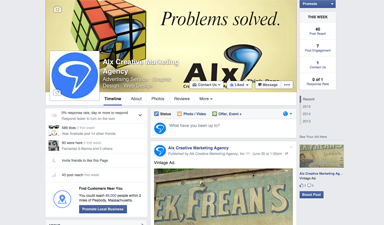 Changing your cover photo will appear higher on your customer’s Facebook feeds, thats a great opportunity to show latest product, event, or service images.